Throughout the years, we have tried all sorts of remedies that are “guaranteed” to prevent and treat hair loss. But, is there really such a miracle product out there that can do this? Yes, there are such products, and many are made with nutrients that are necessary for healthy hair, nails, and skin. There are several types of products with these nutrients available, including dietary supplements and shampoos. Today, we are going to mainly focus on nutrient-rich shampoos. 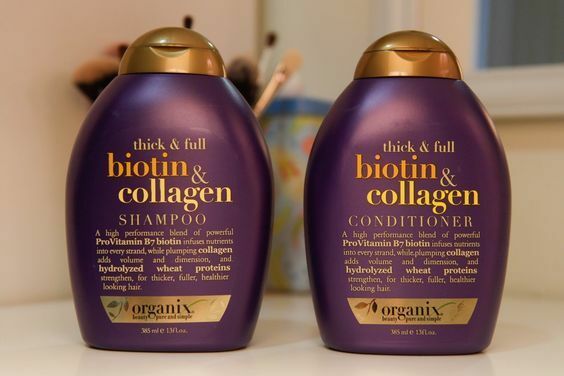 We have reviewed nine biotin shampoos with collagen, argan oil, zinc, coconut oil, and caffeine to find the one that is most helpful for treating and preventing hair loss. Even if you aren’t looking for a shampoo that helps to prevent and treat hair loss, this would still be one to have in your hair care arsenal. This product is loaded with nutrients that promote good hair health, including biotin, vitamin B5, vitamin E, jojoba seed oil, grapefruit, ginseng, lavender, and chamomile. These same ingredients can also be found in the conditioner. This product is vegan, completely free of sulfates, and is also paraben free. It is ideal for all hair types, and will not damage color treated hair. The biotin and vitamin B5 help to improve hair’s elasticity, while the ginseng and lavender extracts help to minimize breakage and repair existing split ends. Hair grows healthier and stronger with continuous use. Use of this biotin shampoo not only helps to nourish the hair, but also the scalp. Users report that their scalps no longer itch from dryness. This shampoo and conditioner boasts biotin, pumpkin seed oil, black cumin seed oil, and nettle as its main ingredients. 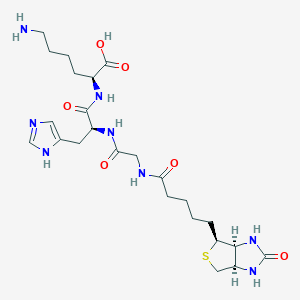 It is 100% natural, and has 15 broad-spectrum DHT blockers. 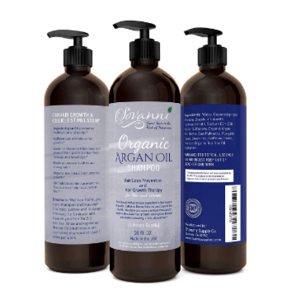 All ingredients are certified organic, and the product is gluten free, hypo-allergenic, color safe, and free of parabens, SLS, and harsh chemicals. 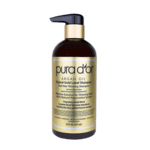 The organic extracts in this formula help to nourish the hair follicles. This can help to promote new hair growth, and reverse prior damage, breakage, hair loss, etc. Hair will be shinier, healthier, and thicker. This is a costly product, but it is well worth it. 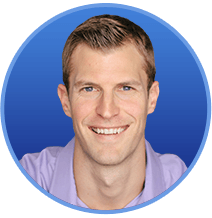 Users report significant improvements in the health and appearance of their hair over time. The shampoo is gentle and effective, great for all hair types, and safe to use every day. Additional natural ingredients, such as aloe vera and Red Korean seaweed help to protect the hair even more against hair loss caused by breakage. A blend of natural, healthy ingredients works to restore hair health, and prevent hair breakage and loss. Ingredients include biotin, saw palmetto, quinoa protein, and vitamin E. It also contains a number of other all-natural ingredients, including aloe vera, chamomile, mint, eucalyptus, tea tree oil, and raspberry extract. The nutrients in this product work to stimulate hair growth, cleansing and nourishing each strand from the follicle to the scalp. Your hair will feel softer, fuller, and thicker after regularly using this shampoo. For those who don’t like a perfumed or floral-scented shampoo, this is a great choice. It has a strong mint scent. Many users notice improved hair health, stronger hair, and less breakage/hair loss within just a few weeks of using this product. 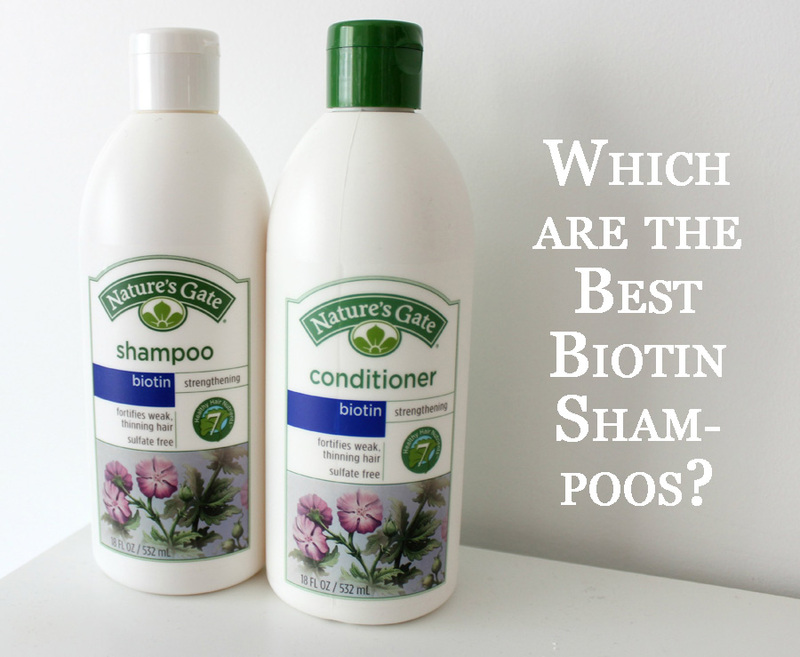 This shampoo with biotin and aloe vera also helps to keep hair soft and shiny. 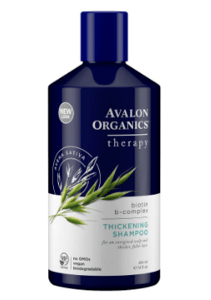 This shampoo contains zinc, tea tree extract, jojoba oil, biotin, rosemary, and olive oil. It works with all hair types, including thick, curly, wavy, or straight, and leaves hair shiny and your scalp free of embarrassing flakes. This is a gentle shampoo, and it is safe to use on color-treated, permed, and chemically relaxed hair. It works well for all hair types, but is geared towards those who have dry hair. It works for thick, straight, wavy, and curly hair, both men and women. 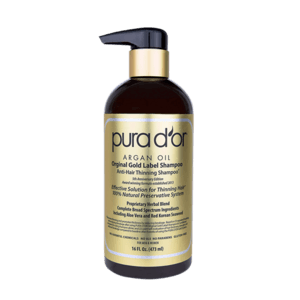 This product helps to eliminate oily hair without stripping away the essential oils. There are no harsh chemicals to dry your hair out, so you are left with hair that is soft, shiny, and manageable. Enjoy a product that is GMP-certified, and non-GMO. It is hypoallergenic, as well as free of sulfates and parabens. The growth-stimulating ingredients in this hair loss shampoo include argan oil, aloe vera, white willow bark, burdock root, rosemary, and thyme. Together, these ingredients help to revitalize the hair follicles, and promote a healthier scalp. The many DHT blockers help to prevent hair damage and hair loss. Thinning hair appears more voluminous, and has more texture and shine, thanks to the natural ingredients that include botanical oils. All ingredients are 100% natural, and this product is vegan as well as cruelty-free. 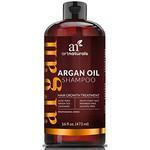 This shampoo stimulates cell renewal, and restores thinning and dull hair. It also helps to prevent additional hair loss. Many users report seeing noticeable differences in hair volume, thickness, and shine after using this product for just a couple of weeks. 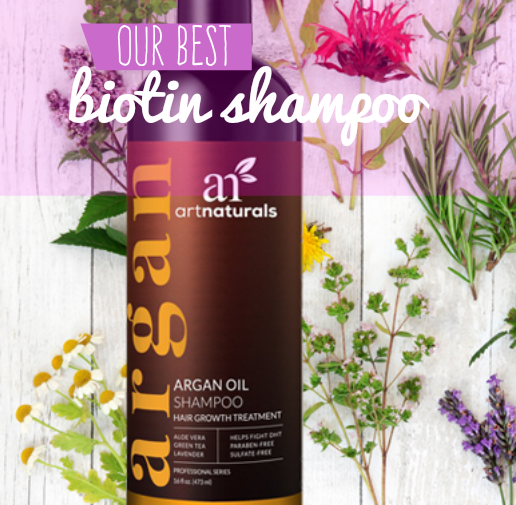 In addition to being a biotin shampoo, this product also contains numerous other natural and healthy ingredients, including organic argan oil, caffeine, keratin, saw palmetto, tea tree oil, nettle, green tea and pumpkin seed. These ingredients help to promote a healthy scalp and hair, and stimulate new hair growth. This is a two-in-one product that helps to prevent hair loss and stimulate new hair growth. It works for all hair types, and helps to fight hair loss in both men and women. It is color safe, hypo-allergenic, and low sensitivity surfactants. While this is higher priced than other similar products, it is on the low end of the higher price scale, and well worth every penny. Some customers recommend using this product over Nioxin and other medicated shampoos. This is a pleasant-smelling shampoo, with just a hint of tea tree oil scent. It has a rich lather, and leaves hair feeling soft and clean. In addition to containing biotin, this product also contains collagen, which helps to increase hair volume. The hydrolyzed wheat proteins help make hair stronger and healthier, and many users report great results after using this shampoo only once. Unlike other hair loss prevention shampoos, this product is safe for color and chemically-treated hair. It will help to thicken and strengthen all hair types. A lot of similar products have more of a chemical smell. This shampoo, and the accompanying conditioner, smell terrific. Many users report that not only is their hair fuller after using this product, but that it also grows faster. They also report regrowth after hair loss. The main ingredients in this biotin hair loss shampoo are procapil, oleanolic acid and apigenin, coconut and castor oil, and of course, biotin. It also contains Procapil, which is a patented formula that helps to grow hair by as much as 121%, and reduce hair loss by as much as 47%. It is even recommended by doctors for alopecia. Strengthen hair follicles for reduced shedding. 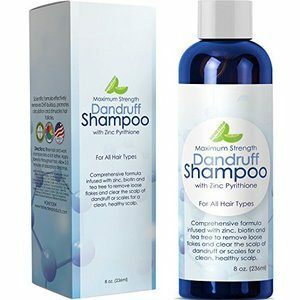 When you buy this product, you also receive a free hair growth guide that is loaded with tips to help restore your hair to its natural beauty. Using this biotin hair loss shampoo will give you more manageability, more volume, more body, more shine, and hair that is healthier than it has ever been. This product is great for those who have thin or brittle hair. 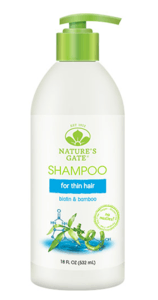 Nourished with biotin and bamboo, it gently cleanses the hair without stripping essential oils. This shampoo is vegan, gluten free, non GMO, paraben free, soy free, and cruelty free. 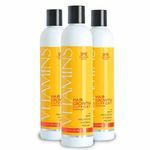 Many customers who use this shampoo with biotin report that they have increased volume in their hair, and reduced hair loss. Hair is shiny, soft, and manageable. This product is also enriched with Pro Vitamin B-5, which is also known to be important for healthy hair, nails, and skin. If you are looking for a hair loss prevention product that is reasonably priced, this is one to seriously consider. For less than $15, you get three, 18-ounce bottles of product. After all was said and done, we found one product that stands heads and shoulders (pun intended) above the rest: Organic Argan Oil Hair Loss Shampoo for Hair Regrowth by Art Naturals. This sulfate-free treatment is a blend of argan oil, aloe vera, rosemary, thyme, burdock root, white willow bark, and other natural ingredients that help to reinvigorate the hair follicles and promote scalp stimulation. This product is vegan, and cruelty free. The only downside is that it is not gluten-free, but our testers didn’t seem to mind because the product works so well. This is a shampoo that works to combat male pattern baldness, and it will help to add volume and texture to your hair. Users noticed a significant difference in the thickness of their hair within two weeks of use. Biotin is a vitamin that is found naturally in a variety of common foods that we eat every day. We need to have biotin in our diets, for a number of reasons. To start with, it is a B complex vitamin, also known as vitamin H, and it helps to metabolize fatty and amino acids in the body. Some research shows that biotin can also help to stabilize blood sugars. Biotin is well-known for promoting healthy hair. In fact, many people who report hair loss and breakage are actually suffering from a biotin deficiency. Fine and brittle hair, and hair loss or total alopecia. By adding more foods with biotin to their diets (along with dietary supplements and other biotin products), people can have healthier hair, not to mention healthier skin and nails, and increased metabolism. If you are eating most, or at least some of these foods regularly, you likely have enough biotin in your body. But, if you are biotin-deficient, you may need to do something about it in order to have healthy looking hair. 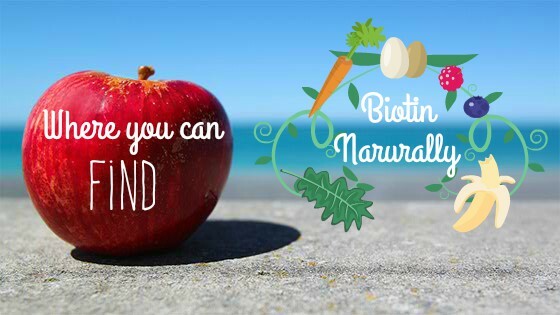 There are some cases where people do not tolerate biotin in food, particularly those with type A blood, as they are not as well able to absorb biotin from food. This is also a problem for people who suffer from GERD, or severe acid reflux. Those who do have problems absorbing biotin would do well to get this nutrient from a supplement rather than from food sources. It is not known how much biotin is needed for hair growth. But, one study has shown that men who take an additional 5mg of biotin daily saw improved hair density, as well as noticing that their natural hair color had returned. In addition to being found in many foods, biotin is also found in a variety of vitamin compounds, dietary supplements, and shampoos and conditioners. Let’s take a look at the various types of biotin products available today. Biotin Supplements – With the exception of foods containing biotin, the best way to get biotin is to take a supplement, which comes in various pill forms (gel caps, capsules, tablets, and gummies). 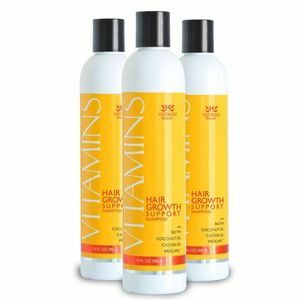 Vitamins For Hair – There are a variety of vitamin blends that are created for hair health, and contain biotin. These are better for hair health than simply taking a multi-vitamin that may not contain biotin or other hair-health nutrients. Shampoos and Conditioners – There are numerous shampoos and conditioners that contain biotin, as well as other ingredients that are well-known for hair health. These products range in price, depending on the ingredients used.